With record high temperatures forecast for the remainder of the summer, we’ll all be wanting to make the most of the sunshine and head outdoors – our pets included! Whilst it is great fun to embrace the sunshine, it is important to remember that the heat and sun can not only be a danger to ourselves, but to our feline friends too. 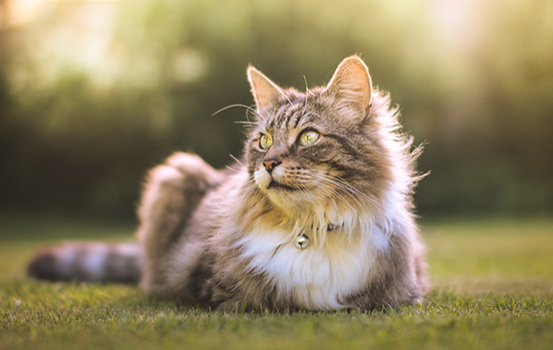 Here Natures Menu’s veterinary team share some top tips on how to keep your beloved cat from getting too hot under the collar in the oncoming heatwave and how to spot whether your cat is suffering in the sun. Keep water bowls topped up: As humans, on a hot day, we consume more litres of water than usual and the same goes for our four-legged friends. With their beautiful thick coats and only their paws to sweat from, cats find it more difficult to regulate their temperature and are therefore more likely to become dehydrated. Ensure their water bowl is constantly topped up or leave multiple bowls out for them if you plan on being away for a longer period of time. Avoid the midday sun: As well as being the hottest part of the day, midday is often when the sun’s rays are at their strongest. Always ensure that an area of shade is easily accessible for your cat, especially if they have thin coats as they’re most at risk of sunburn, which can, in some cases, lead to skin cancer. Speak to your vet to get advice on pet friendly sun cream and try to keep them out of the sun’s direct rays as much as possible. Conservatories: In the warmer weather the temperature in conservatories and greenhouses can soar extremely quickly, and whilst we all know leaving an animal in a confined and hot space is a ‘no no’, many owners are still offenders. Regardless of whether a window is left open, or you’re in the house or not, always ensure that your precious cat has a way of leaving the room if they become uncomfortable in the heat. Watch what they eat: Remember food and drink found at summer BBQs can often be poisonous to cats such as chocolate and alcoholic beverages. Corn on the cobs and kebab skewers can also cause blockages and be choking hazards for pets, so keep out of your cat’s reach. Cool play: Create a cool retreat for your cat to play in by closing all the curtains in a designated room. Why not keep your feline friend entertained, whilst also ensuring they’re kept nice and cool, by simply giving them a few ice cubes to chase around on the floor! Spot the symptoms: As well as taking precautionary measures to help your pet in the hot weather it’s important to be able to spot the symptoms that they might be unwell. Glazed eyes, vomiting, stretching out and breathing rapidly are all signs that your cat may be suffering from heat stroke and requires immediate medical attention. Natures Menu Vet, Claire Miller, said: “It’s important to look after our pets in hot and sunny weather, with their fur often meaning they find it harder to regulate their own body temperature and, of course, they are unable to tell us if they are feeling unwell!